A tsunami warning has been issued for Hawaii after a 7.7-magnitude earthquake rocked an island off the west coast of Canada Saturday. The Pacific Tsunami Warning Center originally said there was no threat to the islands, but a warning was issued later Saturday and remains in effect until 7:00 p.m. Sunday. A small craft advisory is in effect until Sunday morning. A small tsunami prompted state and federal officials to warn people in southeast Alaska and down the Canadian coast to take precautions. The temblor shook the Charlotte Islands area on Saturday night, followed by a 5.8-magnitude aftershock several minutes later. There were no immediate reports of major damage. The U.S. Geological Survey said the quake hit the Queen Charlotte Islands just after 8:00 p.m. local time Saturday at a depth of about 3 miles (5 kilometers) and was centered 96 miles (155 kilometers) south of Masset, British Columbia. 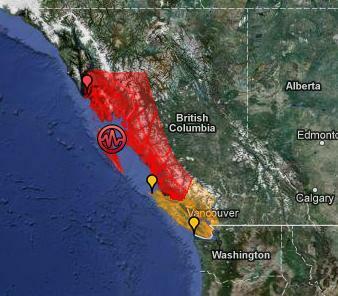 It was one of the biggest earthquakes around Canada in decades and was felt across a wide area around British Columbia. The National Weather Service issued a tsunami warning for coastal areas of British Columbia, southern Alaska and Hawaii. The first wave of the small tsunami, about four inches (101.6 millimeters), hit the southeast Alaska coastal community of Craig. “It appears to be settling down,” he said. The Pacific Tsunami Warning Center originally said there was no threat to the islands of Hawaii, but a warning was issued later Saturday and remains in effect until 7:00 p.m. Sunday. A small craft advisory is in effect until Sunday morning. The center says the first tsunami wave could hit the islands by about 10:30 p.m. local time.